This Hanging Frame has Embedded Magnets in the Acrylic! Hanging Frame for A3 Graphics! The hanging frame has 3mm acrylic with a folded design. This acrylic makes reading your posters very easy to passersby, a great promotional tool! The poster holder, hanging frame is typically used by doctor offices, banks, retail stores, restaurants and more for showing store hours, important information and adverts! These hanging frame holds (2) A3 graphics in portrait orientation. The posters are displayed back to back, advertising in multiple directions at once for maximum exposure. 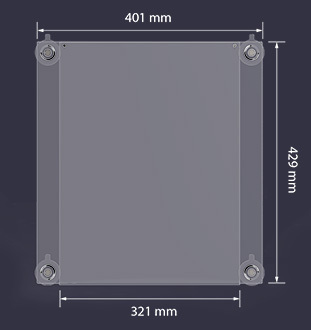 The hanging frame uses 3mm thick clear acrylic for passersby to easily read your posters. The hanging frame, also known as acrylic window hangers and suction cup displays, has magnets embedded in the acrylic frame. 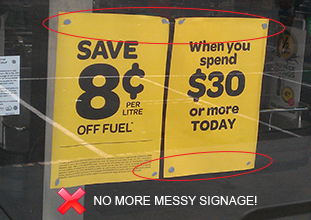 These help to prevent the sign from opening while on display, as well as keep your graphics in place! Switching out posters takes less than 60 seconds using due to the folded acrylic design! The poster holder has (4) suction cups for mounting the frame on to any non-porous surface, such as tiles, windows, and glass doors. The cups must be moistened before attaching to the window. 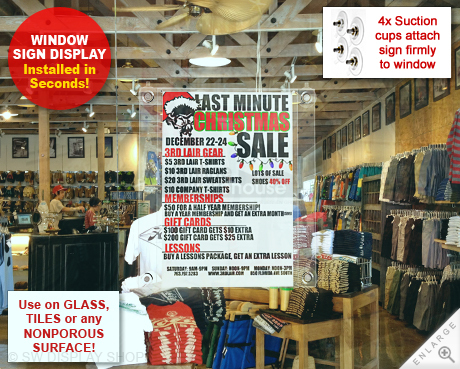 This window display makes promoting and displaying information at your business easy! Our acrylic sign displays have different sizes & formats to choose from to provide businesses with an easy choice. All of the sign mounts are available now for you to promote with at your company! 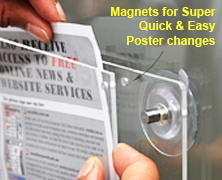 The poster holder also uses 3mm acrylic with embedded magnets that holds A3 graphics in portrait orientation. 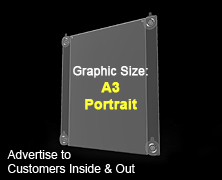 This is a great way to display adverts in your business! The online catalogue has many displays to choose from in a variety of different categories. With high quality products at low prices, Slimline Warehouse has become a national leader with a wide customer base. We ship Australia-wide, with Sydney, Brisbane, Melbourne, Canberra, Gold Coast & Adelaide included! Same day despatch offered on most in stock products when purchased by 1pm EST, order now!